Is there interest in VIA Rail Canada? You bet. Are there at least 100 people in North America who will order a book or two on VIA Rail in the first two months after it's released? For sure. I'm pleased to note that just in time for Christmas, over 100 copies of my newest VIA Rail book, Trackside with VIA: Cross-Canada Compendium have winged their way to customers all over Canada and the US since I released them in late-October. (Just today, a VIA fan's family member arrived on my doorstep to pick up two copies just in time for Christmas.) This number is sure to climb upwards as hobby shop sales build in the new year. 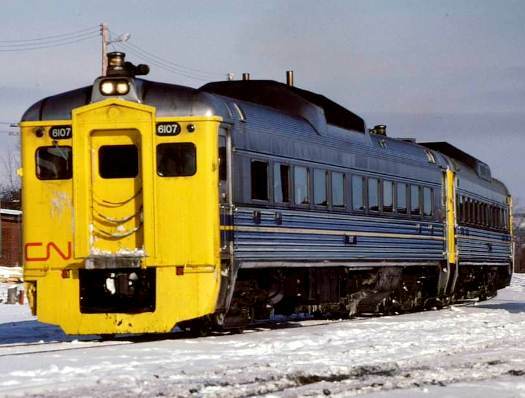 This is in no small part due to the contributions of ardent VIA enthusiasts and photographers like Gary Hadfield (photo of RDC-1 6107 - above) and Brian Schuff (photo of 1413 at Winnipeg - below) who generously supported me in this project. 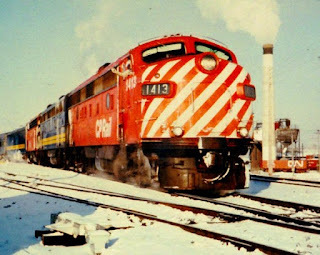 Also closing in on 100 copies is my other new book, the Trackside with VIA: Cross-Canada Compendium Consist Companion . Ordered nearly one-for-one with the Compendium, customers are proving that there is indeed interest in VIA Rail train consist information. And why not? Long overlooked, I believe this type of information is of great interest today, to modelers and enthusiasts alike. If you haven't ordered yet and Santa left some cash in your stocking, please see the printable order form, top right sidebar of this blog. If you're reading this, please accept a small Christmas gift from me in the form of a Trackside Treasure (my main blog) post on VIA's Canadian in 1984, including photos and consists I recorded in Manitoba in that year. Thanks to all for your support, your interest in my books, and may I wish you a happy, healthy and prosperous year to come in 2013!